Vintage Sterling Silver Embossed Cross Wide Ring. Vintage sterling silver, fully hallmarked, embossed cross pattern, wide ring. 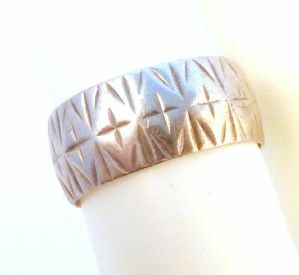 Vintage sterling silver embossed cross pattern wide ring. Formed from sterling silver with an abstract embossed cross design that repeated throughout the band of the ring. Fully hallmarked for sterling silver, Sheffield 1978. The ring is a UK Size L 1/2, US size 5 7/8. Ring Size UK L 1/2 , US 5 7/8. Sterling silver embossed cross pattern ring.